This way the doctors can easily control their availability and make their preferences on positions and shifts visible to the management. The management will also have a clear view into distribution of work loads, doctor availability and the filling of the shifts. Since hour reports will be automatically populated from the work plan, this will also reduce the amount of duplicate reporting needed. Some modifications will be required to OpenPSA to make it work better with shift planning. Documentation about particular work positions or locations will be stored as attachments to the tasks. This enables doctors to quickly access them from the OpenPSA front page. 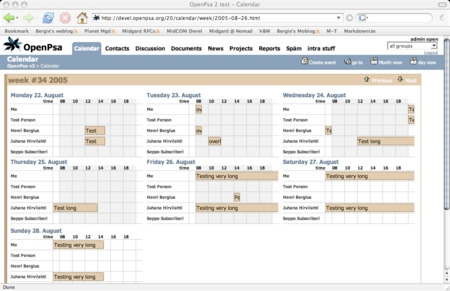 In addition to using Projects and Calendar, the client will also start using some other parts of OpenPSA, including Sales for managing new business projects and Discussion for company's internal chat. To help make the system more popular the Horde webmail application will also be integrated to the OpenPSA interface. The organization works in a very virtual and distributed way, and so OpenPSA will provide them with all the communication and management tools they need for efficient operation. Other reasons why the chose OpenPSA included a very good feature match, a friendly user interface, and cheap hosting costs. 26 August 2005. 1 minute read.